Some words should simply never be placed next to each other. Two words that I’ll try not to use together are ‘sleep’ and ‘study’. 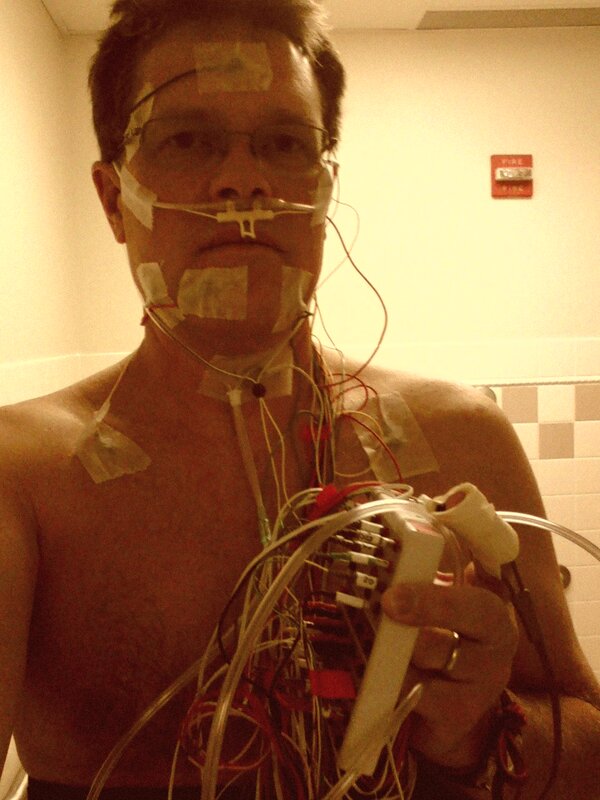 All in all, undergoing a sleep study wasn’t a horrible experience, per se. Brutal seems a better adjective. For one already having issues getting sufficient sleep at night, the idea of glueing ~25 sensors to my head, face, neck, chest, finger and legs with all of the wires from each sensor attached to a “break-out’ box on the headboard of the bed is, well, unnerving. I mustn’t forget the elastic bands around my chest and stomach and oxygen tube thing that gets placed in your nostrils. That feels good – NOT! Thankfully a “silver bullet” to monitor core body temperature isn’t required. Ask a Marine – they’ll know of what I speak. Suffice it to say, though, it isn’t oral! But my fears were quickly allayed when, after I was all wired up, the sleepologist explained how it would be possible, if necessary, for me to get up in the night and use the bathroom. That was a relief! Yes, pun intended! To my dismay, the technician wanted me to sleep on my back. That was really awkward as I primarily sleep on my side or stomach. I was able to relax and do a little reading and even watched the end of a baseball game on TV. Eventually I felt tired enough and thought I was ready to sleep. If I ever wondered how they were going to “put me to sleep”, now was the time. I half expected that I would be given some kind of quick acting, short lasting sedative. Nope. After you’re in bed and the myriad of wires are attached to the breakout box, the sleepologist turns out the lights. Then, from the control room via a speaker phone, the sleepologist goes through a series of checks for all the sensors to ensure that everything is working. After I had moved my eyes in different directions, clenched my teeth, breathed in a couple of times, held my breath, wriggled my legs – she as much said everything looked good and with a pleasant, “good night” – I was on my own. I had previously been told that there is an infrared camera and microphone to correlate audible snoring sounds and body movements with electrical signals in the brain to better diagnose sleeping anomalies. It made me want to ask the sleepologist if she’d heard or observed any funny things with her patients? But I thought it best to keep my dignity to myself in part because I realized that something might happen to me and I might become one of those “stories”. I opted to keep my watch during the night. I wanted to know where I was within the “process” – how much longer is this going to last? In hindsight, this might have been a mistake. I don’t know. Still, being wired up and in an unusual position, it was difficult falling asleep. But I guess I did. Or, so I was later told. In fact, the sleepologist told me that my best sleep came after I had initially fallen asleep. I had remained asleep for perhaps an hour and a half before I woke up. Thereafter, the sleepologist told me that my sleeping was very erratic and I don’t really know how much sleep I actually got. Maybe three hours total? Maybe four? I woke up for the last time a little before 5am and laid there trying to get some additional sleep. I felt terrible – almost as though I had a cold; a little stiff and sore and a headache too boot. At 6am I “rang the bell” and informed the sleepologist that I was done and wanted up. She agreed and knew I had been just laying there awake for a little over an hour. Hopefully I hadn’t done anything worthy of a story for her colleagues. Anyway, she needed to verify that all the electrodes were still functioning so we repeated the pre-sleep tests. After all the electrodes had been removed, I took a shower, dressed and then filled out a questionnaire regarding patient satisfaction. The technician had previously informed me that any results would have to be discussed with the doctor in a subsequent follow-up visit. So, that’s the next step – see what the doctor orders. I’m certainly not anxious to be diagnosed with a malady that will be alleviated with a CPAP machine. Then again, I’m tired (literally!) of always seeming to lack energy and dragging myself from one activity to the next whether at work or meeting with friends. But, we’ll see where this leads. The symptoms are what they are and the condition is what it is and if using a CPAP will bring relief then we’ll figure out how to do it. The doctor’s evaluation of my sleep study is that my sleep is interrupted by something called mild obstruction sleep apnea. For most people, full and partial airway closures, snoring, and something called “near misses” are more prevalent when sleeping on one’s back than when sleeping on one’s side. And, such is the case for me. To that end, a CPAP or even some kind of a dental mouth guard called a mandibular repositioning appliance would help with the breathing and snoring. However, whether I’m on my back or on my side, there are numerous one-to-three second periods, or as the doctor called them – arousals – that also keep me from getting normal deep sleep and which would not be helped by a CPAP or dental appliance. These arousals are often related to things like pain, stress, and temperature and it’s not clear (at least to me) that any of these are reasons why I’m waking up. So, at this point, I’m not sure what to do next. Great picture of you Bob! You never looked better! You just wait Todd – your turn is coming, too! Hahaha! I enjoyed reading about your experience from the patient side of things! Well, at least there were no shots involved! OMG! No WONDER you had a hard time sleeping! That’s a HECK of a lot of wires/gadgets!!!!!! I only had 3 wires around midsection/chest and two nose hoses and a finger pulse thingy. WOW!!!!!! CT – didn’t they monitor brain waves and eye movement et al during your study? I thought that was standard fare for these kinds of things. Oh well. I look forward to getting the results in a couple of weeks. Stay tuned. Bob, been there done that, but I think it is called a CPAP machine. At least mine is. My choice was a mask that fits fully over my nose (like an oxygen mask you see firemen use on fire victims). It was weird to get used to wearing at night while sleeping but at least I do sleep through the night now. I had no idea how badly I was sleeping until I got the CPAP. Makes a ton of difference. Go with it. Oops – CPAP, right! My error – I made the correction; thanks. I appreciate the encouragement and am glad that it has worked out (apparently well) for you. After the study I did stop into the “sleep store” conveniently located next to the sleep study center. I wonder why? Anyway, those masks seem to come in all shapes and sizes and I’m sure we’ll figure out what would work best. So, any updates on the CPAP? Thanks for asking, CT. I look at that picture and wonder how did I ever manage to get ANY sleep that night? There are as yet unknown reasons as to why I’m waking up often during the night or otherwise not getting into the REM state of sleep. The doctor doing the evaluation called those waking up times ‘arousals’ – but I assure you, that doesn’t mean what one might think it does. There were some breathing anomalies observed when I was placed on my back but not nearly to the degree as when I was sleeping on my side. To that end, I’m not convinced that I would benefit from a CPAP. At least, not yet. As it is, and because I’m still not getting good sleep, I’ll be meeting soon with another sleep doctor for a 2nd opinion. Wow! So in a little over 3 months, not much has been accomplished?!?!? Oh my friend!!!!! Maybe you have that “brain” apnea– for lack of the medical terminology? I think it’s Central Apnea??? Or maybe you just need Ambien or something? Are you just not getting into REM sleep or are you actually having an apnea (where you stop breathing for a bit)? Your concern is appreciated, CT. Breathing on my side is not problematic. On my back; somewhat. As it is, I am not easily getting into the REM state – or when I do, I am often ‘aroused’ out of it for unknown reasons. I will be asking the Dr re Ambien et al.